November 29, 2012 (San Diego) -- Before reading Chocolate and Corn Flour, I did not know that there was such a thing as a "Black" Mexico.” Having lived in Tijuana, Mexico for a number of years and visited a number of Mexican cities, such as Cancun and Rosarito Beach, this book comes as a revelation to me. July 28, 2012 (El Cajon)--What was life like 100 years ago here in El Cajon? As part of the Centennial Celebration for the City, the El Cajon Library and the El Cajon Historical Society are presenting a "Journey To Our Historical Past" speaker series starting August 2. There are currently seven presentations scheduled for the first and third Thursday of the month in the Community Room of the library, 201 E. Douglas Avenue, from 6:30 to 7:30 p.m.
July 15, 2012 (San Diego) -- Women are involved in many aspects of the comics industry. At Comic-Con, ECM interviewed two women, Anina Bennet and Susie Cagle, who have left some power-packed marks in their own industry niches. "Each one remembers only in part. Seldom is an incident, a character, or a scene with all the lights and shadows peculiar to it alone remembered entirely by any one person. Thus the fabric of history must be a weaving together of many memories to pattern the whole cloth." June 25, 2012 (Alpine) -- As Alpine celebrated its heritage during the first weekend of June, it can be noted with some irony that the conditions which forged this community into existence are still ever present and not going away. A 100 years from now, what will be remembered about Alpine during these early days of the 21st Century? June 15, 2012 (San Diego) --San Diegans Richard Lederer and Caroline McCullagh are the proud parents of a bouncing baby book, American Trivia: What We All Should Know About U.S. History, Culture & Geography (Gibbs Smith Publisher, 2012). Over a span of a year, the co-authors will share with you their journey through American history. You can order inscribed and signed copies of the book by writing to richard.lederer@pobox.com. 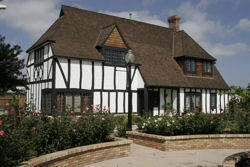 February 17, 2012 (El Cajon) -- El Cajon has two great museums to visit during February - museum month. The Knox House has a wealth of information about the 100-year history of the City of El Cajon, displaying photos and artifacts. The Knox House was the first commercial building in El Cajon, built in 1876 as a hotel for travelers on their way to the Julian gold mines. The Knox House Museum will be open each Saturday in February, from 11:00 a.m. to 2:00 p.m., at 280 N. Magnolia Avenue in El Cajon. Admission is free. You can also schedule private tours for your class or organization. For more information, please call (619) 444-3800, or visit www.elcajonhistory.org.